From Punta Patillas, our last stop on the South Coast of Puerto Rico, we decided to go all the way to the Fajardo area. That was a 40 mile trip, which most cruisers cut in half by stopping somewhere along the East Coast. The few options there, did not allow us (or the dogs) to go to shore and we were getting antsy to leave the country, so we went all the way. The sky was blue, but the wind came out of the North East, apparently a normalcy in winter, making it impossible for us to sail again, since we were headed north. From the moment we rounded the South Eastern cape, our excitement rose about getting to our last destination in “mainland” Puerto Rico. The last hour we got to sail a bit and we reached the anchorage of Isleta well before dark. We’d heard from quite a few people who anchored here. We wondered why… The protected places were filled with boats on moorings, so we had to drop our anchor, way out. We tried an open spot closer to shore, but got yelled at by a ferry driver. We were in his way and had to move. Now we were located on the outside of the anchorage, a little bit behind the reef, with little protection from the wind and chop. The boat was rocking non-stop and we were very uncomfortable. 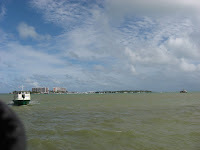 The anchorage of Isleta is near a little island with a marina, a boat yard and condos. To get to the mainland, you have to cross a half mile stretch of water. When there is a lot of wind, it is impossible to do this, so you are trapped “on the other side”, with no services, no stores, no internet, no garbage disposal… And, it got very windy over the next days. The only reason we were here, was to get hauled in the Isleta boat yard. While we were bouncing around, we wanted to get out of the water as quickly as possible, do our work and leave. From our boat we could see the Spanish Virgin Islands all around us. Luring, but unreachable. Yet. From the moment we were settled, we went to shore to inquire about the haul-out. It was Saturday, 4 pm. The office was closed… We looked at the Travelift and a shock went through our body. It was not wide enough for our catamaran! When we called them before, it didn’t seem a problem. We noticed a rusty rail lift and realized that this would be the way they’d have to get us out of the water. This method would be more expensive and we’d have to stay on the thing until we got back into the water… While walking around, we stumbled across a little, chubby guy, who thought he was in charge of the world. He told us we had to pay $10 each time we left our dinghy on the island. For that price we could use their ferry to the mainland and the other facilities. Pretty expensive, but the only alternative when it was windy. We figured we’d take our dinghy across the water, even though the dock in Puerto Real was a total disaster with dangerous holes and planks missing. It sure was a hassle being here. Of course, the office was closed on Sunday, so we returned on Monday, first thing in the morning. When the person in charge finally showed up, we found out the rail lift was indeed much more expensive and it was reserved from Tuesday for seven to ten days. What a bummer. There was no way we would just sit that long in the bad anchorage. We could go to one of the pretty islands and come back after a week… We hoped the other boat only needed a week to get the work done, but we knew out of experience that boat projects always take longer than planned. This was not very good news. We would be on the dry for Christmas. Not very tempting. That Tuesday, we rented a car and drove to Puerto Del Rey boat yard, not too far away. The first time we phoned to the person in charge, she gave us the rates and told us we couldn’t do our own work and we couldn’t stay on our boat while it was out of the water. We gave up on Puerto Del Rey. We called them again when Isleta didn’t seem to work out. From that conversation, we learned, we COULD do our own work as long as we followed the rules. We still weren’t allowed to live on the boat there. So, this time we decided to talk to the manager in person. She was a very friendly and understanding woman. 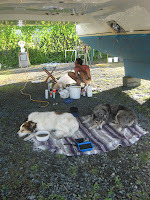 When we explained our situation, she agreed to us staying on the boat for the duration of our work and … the dogs weren’t a problem. We booked our haul-out for the coming Thursday and were excited about this good news. The rest of the day, we did more shopping and dealt with more problems with our post packages. We also drove all the way to the capital, San Juan, to pick up bottom paint for Irie. Mark and I had planned our time out of the water well. We would need four to five days of hard work to get it all done. On Thursday, we waited for hours until they finally lifted Irie out of the water! It was 3pm by the time we were blocked and settled on the dry. We’d expected to be settled by 11 am! The power washing took the rest of the day, so we only got about one hour of work in on this first day. A total waste of a day. This big delay, the unavailability of water on Saturday and the fact we did not buy enough paint, made us live on land for a week. The bathrooms with cold showers were a half a mile walk away, our fridge didn’t work, so we needed ice and climbing on and off was tricky for Kali and Darwin as well as for us. The gravel ground was pretty dirty, but luckily, there was a big grassy area close by. The dogs loved it there. For the following three days, we worked for ten hours straight. The bottom got scraped, sanded, washed, cleaned with thinner, taped off and painted twice. We replaced three thru-holes, marked the anchor chain, got the propellers fixed, repainted them and the sail drives, changed the oil in the sail drives, and added new zincs. All for of us were blue for days. The only time off was spent with our pups on the grass in the evenings, until the bugs drove us back inside. 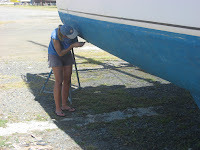 The work was made a bit harder and more painful with the presence of fire ants on the ground next to the boat. One day we had to rent a car again, because we ran out of bottom paint. 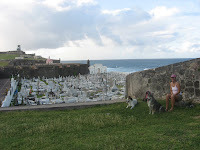 We took the dogs this time for our drive to San Juan and decided to take the afternoon off to see the old town, which was very charming and special. Parts were off limits for us, because the dogs weren’t allowed to walk there, but the old, well preserved city wall, cobblestone roads, colonial buildings and two forts were interesting sights. The last two days in the boat yard, we finished the painting, re-caulked the transom and washed the cockpit. It was great to have unlimited water and finally clean the outside of the boat and to fill the tank without having to haul six gallon jugs back and forth to shore with the dinghy. Once back in the water, we moved back to the Isleta anchorage, the only place to drop the hook in this area. Man, did we hate that place! We couldn’t wait to leave and start exploring the wonderful islands! Our little family rented a car for one more 24 hour period. 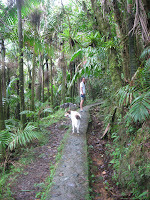 The first evening, we finished our re-provisioning and the next day, the four of us visited El Yunque National Forest. We stopped at several view points, walked to a couple of waterfalls and through the rain forest. It was pretty, but cloudy and wet. The dogs loved the exercise. The girls were exhausted at the end of the day! Hi! 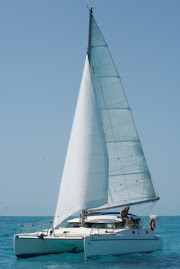 Just read your blog and are intrigued...we have a 46 FP and are looking to haul her out here in Puerto Rico too. How did you strap her? What was the cost (per foot or what?). any information you could e mail to us would really be a help......Liz and Bob on "Bottom Feeder". Thanks! I don't have your email address, but I hope you get my message this way. Fountain Pajot's are great, aren't they? We are very happy with our Irie even though she is relatively small. 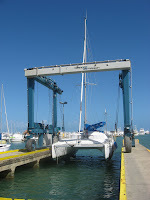 I think Puerto Del Ray Marina/boat yard is the only place where you can even haul out your boat in Puerto Rico. I don't remember the price per foot (and don't seem to find any info/receipts on paper), but that would have been outdated info anyway, since we hauled out there over two years ago. They have three different sizes travelifts and the bigger you go, the more expensive it gets. Good luck with the haul-out and definitely try to visit Old San Juan by car. Enterprise is the cheapest car rental place. We paid $25 per day and reserved online and they might bring the car to you in the yard.